This example shows how to use looptune to decouple the two main feedback loops in a distillation column. 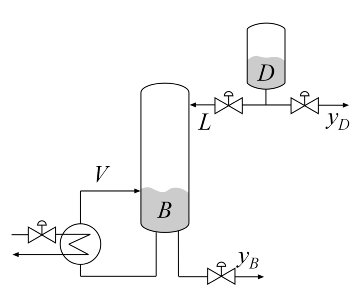 This example uses a simple model of the distillation column shown below. In the so-called LV configuration, the controlled variables are the concentrations yD and yB of the chemicals D (tops) and B (bottoms), and the manipulated variables are the reflux L and boilup V. This process exhibits strong coupling and large variations in steady-state gain for some combinations of L and V. For more details, see Skogestad and Postlethwaite, Multivariable Feedback Control. The unit of time is minutes (all plots are in minutes, not seconds). To achieve these objectives we use the control architecture shown below. This architecture consists of a static decoupling matrix DM in series with two PI controllers for the reflux L and boilup V.
The looptune command provides a quick way to tune MIMO feedback loops. 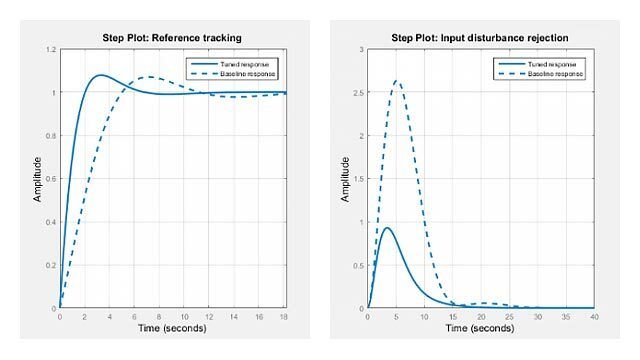 When the control system is modeled in Simulink, you just specify the tuned blocks, the control and measurement signals, and the desired bandwidth, and looptune automatically sets up the problem and tunes the controller parameters. 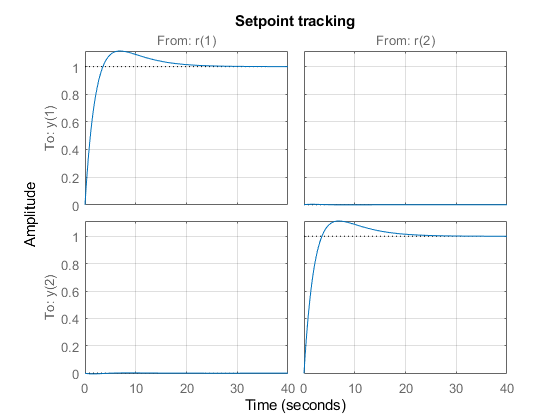 looptune shapes the open-loop response to provide integral action, roll-off, and adequate MIMO stability margins. Use the slTuner interface to specify the tuned blocks, the controller I/Os, and signals of interest for closed-loop validation. 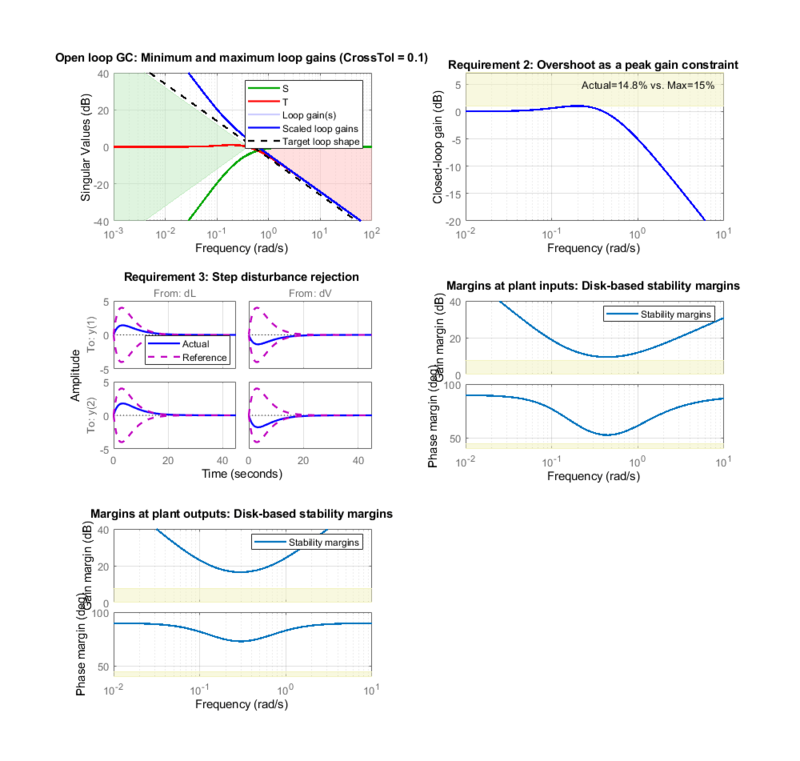 Set the control bandwidth by specifying the gain crossover frequency for the open-loop response. For a response time of 4 minutes, the crossover frequency should be approximately 2/4 = 0.5 rad/min. Use TuningGoal objects to specify the remaining control objectives. The response to a step command should have less than 15% overshoot. The response to a step disturbance at the plant input should be well damped, settle in less than 20 minutes, and not exceed 4 in amplitude. Next use looptune to tune the controller blocks PI_L, PI_V, and DM subject to the disturbance rejection requirement. Achieved target gain value TargetGain=1. The final value is near 1 which indicates that all requirements were met. Use loopview to check the resulting design. The responses should stay outside the shaded areas. 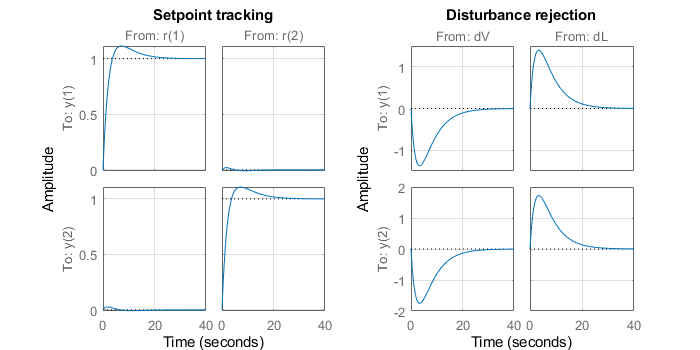 Use getIOTransfer to access and plot the closed-loop responses from reference and disturbance to the tops and bottoms concentrations. 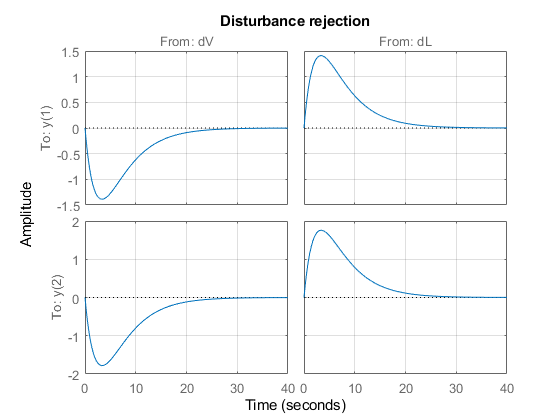 The tuned responses show a good compromise between tracking and disturbance rejection. 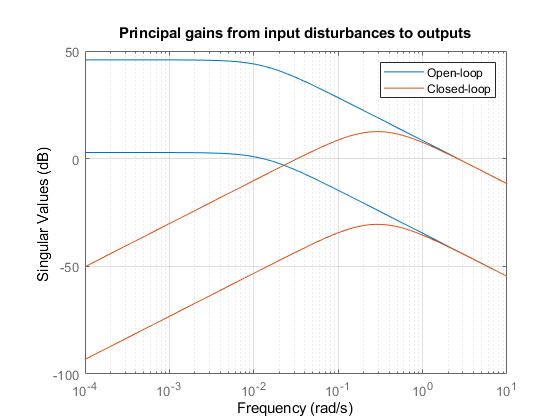 Comparing the open- and closed-loop disturbance rejection characteristics in the frequency domain shows a clear improvement inside the control bandwidth. Inspection of the controller obtained above shows that the second PI controller has negative gains. This is due to the negative signs in the second input channels of the plant . In addition, the tunable elements are over-parameterized because multiplying DM by two and dividing the PI gains by two does not change the overall controller. To address these issues, fix the (1,1) entry of DM to 1 and the (2,2) entry to -1. Re-tune the controller for the reduced set of tunable parameters. The step responses look similar but the values of DM and the PI gains are more suitable for implementation. If you do not have a Simulink model of the control system, you can use LTI objects and Control Design blocks to create a MATLAB representation of the following block diagram. First parameterize the tunable elements using Control Design blocks. Use the tunableGain object to parameterize DM and fix DM(1,1)=1 and DM(2,2)=-1. This creates a 2x2 static gain with the off-diagonal entries as tunable parameters. Next construct a model C0 of the controller in Figure 2. Now tune the controller parameters with looptune as done previously. 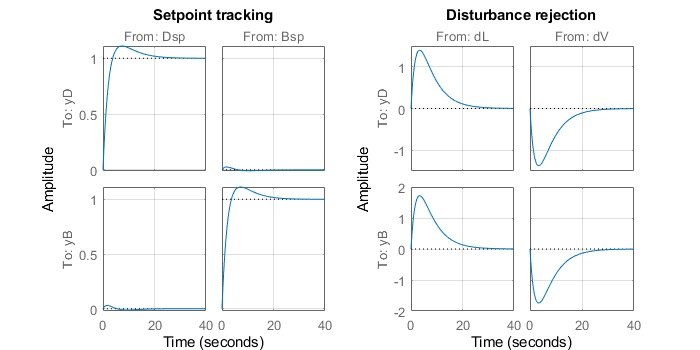 To validate the design, close the loop with the tuned compensator C and simulate the step responses for setpoint tracking and disturbance rejection. The results are similar to those obtained in Simulink.